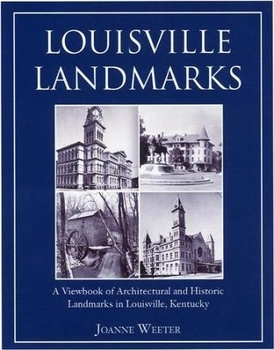 As the City of Louisville prepared to host the 2004 annual conference of the National Trust for Historic Preservation, Louisville Metro's Historic Preservation Officer Joanne Weeter unveiled the perfect guidebook to discovering and revisiting Louisville's most significant buildings, historic residences, and landmarks. Over 60 sites are showcased in the book, compiling vintage and contemporary photographs and informative text about the dates, the architects, and the style, significance, and historic status of each structure. Hardbound in a handy purse-sized volume, this is the perfect touring companion for anyone wanting to visit the many historically and architecturally significant treasures located in Kentucky's largest city. Joanne Weeter is the former director of the city of Louisville's Historic Preservation office, and was with the city's Historic Landmarks and Preservation Districts Commission for 22 years. She is currently working on a new book on the history of Louisville's Carnegie Libraries.